It’s so nice to finally be getting summer weather here, for now I’m enjoying the heat and appreciated the perfect conditions for a 3.2 mile run this morning. As much as I enjoy running races, it’s kind of nice to run just for exercise without the stress of pushing my distance and time. I’m not sure when my next race will be since I’m currently not signed up for any, I’m just enjoying running as another therapeutic form of cardio. We also made more progress on out new home office, the big reveal is coming soon. And hubby and I saw Super 8 – absolutely loved it! For me it was a fun throwback to E.T. and Goonies while being much better. Then we survived a trip to Costco, a miracle for a Saturday afternoon. But I desperately needed to stock up on more produce and thrilled to see a better selection of organic produce including local organic grapes that weren’t too horribly pricey and wonderfully crisp and sweet. Having a stash of frozen grapes is a must during the summer for me, they’re the perfect quick cool down snack when we’re in triple-digit heat. 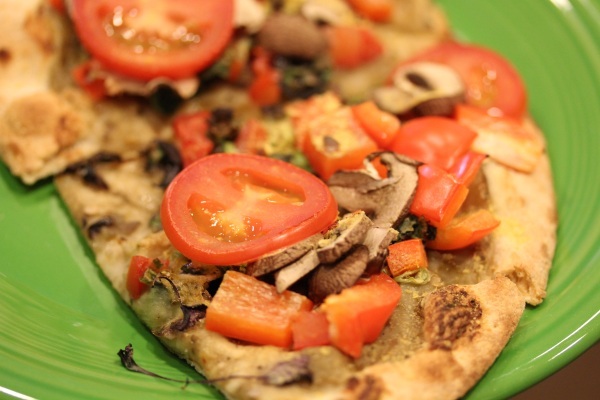 For dinner I remixed the pizza leftovers from last night adding more fresh veggies, fresh chopped basil leaves from our garden and sprinkled with nutritional yeast. Good, but dessert is where things get exciting! I was having a chocolate craving and decided to make vegan rice crispy treats. I bought the ingredients for them a couple of weeks ago at Whole Foods, then kept putting off making them because I remember the process being so messy from my childhood. We microwaved a sticky marshmallow mess and getting the mixture stuck everywhere but the pan. Surfing the wed to the rescue! I found a much easier method using a big, non-stick soup pot. 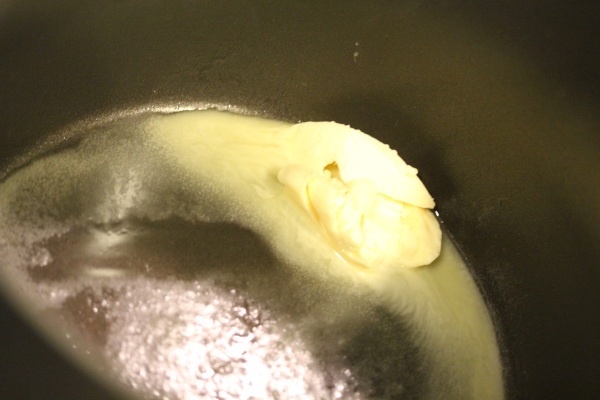 Melt buttery spread in a large, non-stick soup pot over medium heat. Add marshmallows and cacao powder and melt to creamy texture. 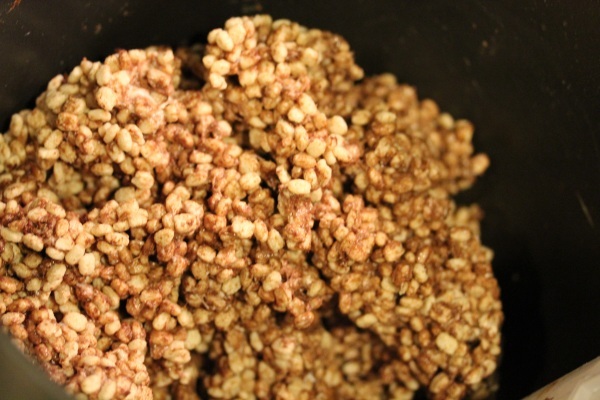 Reduce heat to low and add cereal, then thoroughly mix and coat with mixture by turning with a spatula. 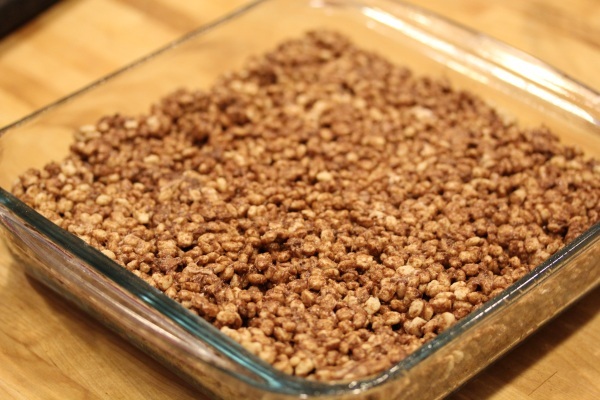 Scoop mixture into a greased 9″ (or so) square glass pan. 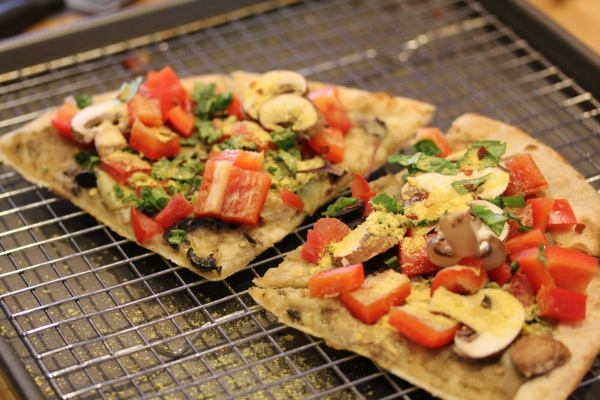 Cool in the fridge for 15-30 minutes before cutting into squares and serving. Makes 9 servings. 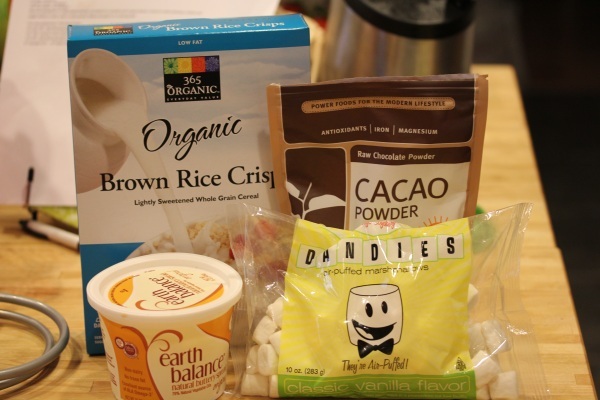 My first time trying Dandies vegan marshmallows and they taste great, like a richer, heartier alternative to the cheap, air-puffed ones I remember. Wow, it’s been ages since I’ve had rice crispy treats! What a fun throwback to my childhood this was, they tasted a lot like I remember with a not-too-sweet chocolate flavor distributed throughout. Too fun! I want to eat those rice crispy treats for breakfast! YUM! I am the RKT queen!! I dont use vegan ‘mallows or organic brown rice cereal..you get big points for those! Would love to hear your thoughts on those Dandies mallows. I have tried the Sara Sweet ones and they are good but pricey. I end up buying the groc store, i.e. Jet Puffed Kraft ones, and i know they’re not vegan but they never let me down in my RKT recipes. The cocoa powder addition is nice thinking! 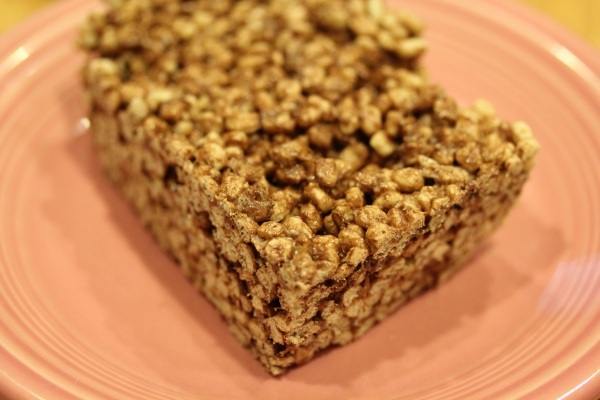 Haha…it’s been SO long since I’ve had a rice krispie treat– these look awesome! Yummmm, now I’m craving rice krispie treats! I always loved how they’re just the tiniest bit salty from the butter/EB and gooey. How did you like the vegan marshmallows?